The Methodist Church, with its distinctive musical inheritance by which the worldwide Church has been enriched, famously expresses its theology through its singing. Its authorised hymnbook therefore means more than a hymn book does in other traditions - it expresses the central beliefs of the Church itself and is commended to congregations as their core worship resource. 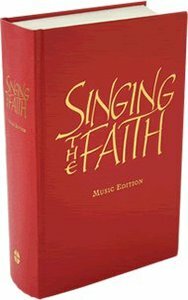 Seven years in development, Singing the Faith is authorised by the Methodist Conference and replaces Hymns and Psalms, published almost 30 years ago. Containing the classic, best loved hymns of the Christian tradition it also incorporates many bold and exciting elements including hymns, songs and liturgical chants from the world church. A large proportion of its 830+ items are 20th and 21st century compositions, offering congregations a feast of musical choices spanning centuries and continents. It is arranged thematically in three parts:God's Eternal Goodness - the Trinity, praise and adoration, creation, gathering for worship, Scripture and revelation God's Redeeming Work - the life of Christ revealed throughout the Christian yearGod's Enduring Purposes - the Holy Spirit, our life in God, prayer, the sacraments, our human journeys, the saints and the life to come.Many helpful indexes enable fitting choices to be made that will enrich all occasions of worship. About "Singing the Faith (Words Edition)"